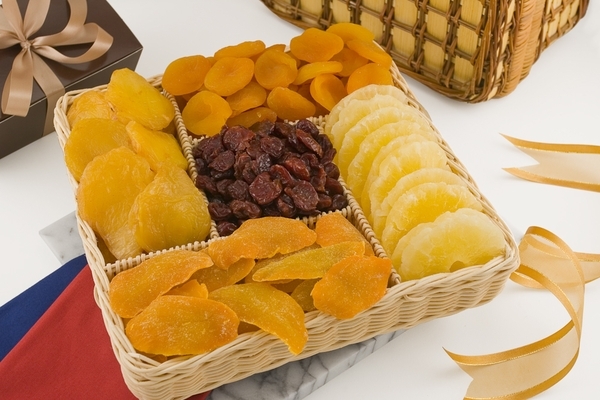 Send a smile with this generous assortment of healthy, soft, naturally sweet, plump dried fruits. This gourmet gift assortment makes a fine choice for any personal milestone or career achievement. Contains: Dried Cherries, Jumbo Apricots, Dried Mangos, Dried Pears and Dried Pineapples. Fruit and Nut Basket - Nuts in Bulk - Net WT. 2 Pounds. Cherries, Apricots, Mango, Pears, Pineapple, fructose, sucrose , FD&C Yellow #5, sulphur dioxide. Outstanding quality and value! Makes a great gift. Sent as a gift and the receiver loved it! Sent this as a get well gift. It was greatly appreciated.